Consolidated EBITDA for the quarter was Rs 128.5 Crores, which grew by 4% as compared to Rs123 crore in the same period last year. Consolidated PAT for the quarter was Rs 44.3 Crores which is up by about 3% as compared to last year. Regional movies because of Baahubali, they contributed almost 23% of our admits in this quarter and the Bollywood and Hollywood movies contributed the remaining 77%, out of which Bollywood was 56% and remaining was Hollywood movies. The rise in pricing from the last quarter has been the main factor behind the growth in revenue. While it has led to an increase of 11% in the Box Office revenues for this quarter. Movies like Baahubali gave a fantastic May. Hopes were extremely high that the end quarter will end with a bang with Tubelight but that didn’t live upto the expectation and that is considered to be one of the main reason for the footfall drop. F&B and advertising which is the non-Box Office pieces continuebto do exceedingly well. Spent per head growth on F&B was 10% during the quarter. Advertising revenues overall grew by 31% during the quarter and are up to Rs 67.4 crore; whereas, F&B grew by 10%. Both are expected to do well in future. In Q2FY18, July has a slightly slow month, as it started off with Tubelight. But August is looking like a very big month. August has a lot of big films coming up. The distribution business production is something which the company has ceased for quite some time. But distribution has been consistently growing the business. And it doesn’t look like that there will be any problem in sustaining the growth over the next three quarters as well. The average ticket price during the quarter was about Rs214 across the entire cinema circuit with 2.1 crore footfalls during the quarter. The screens networks has grown to 587 screens with 8 new screens added in this quarter out of which 5 screen multiplexes were added in chennai and 3 screens in Kota. 30 more screens are absolutely ready, are either awaiting licences or waiting mall completions so that they could also open. And if everything goes as per the expectation than the year will end with about 65 to 70 new screen additions. Under the revised regulations, the local bodies are empowered to levy Local Body Taxes in the form of Entertainment Tax on cinemas in addition to the GST. Tamil Nadu had amended the act and levied a 30% Local Body Tax on top of GST. But subsequent to the representations made by cinemas in the state, the government has currently set up a committee which is examining all the issues which cinemas had raised. The local body tax issue that in what form and manner and what it should be, if it should get levied. If the tax is levied then the only choice that the industry have is to really pass on this additional tax burden in form of higher ticket price to the customer. Strong representation has been made considering the industry is already taxed at 28%. Effective rates in some states have gone down while in other states, they have gone up. So, when the national picture is taken in consideration the company’s management has taken the stand that they will pass on the benefits to their consumers. No reduction in the average rate of tax on tickets. Their effective tax rate on F&B has moved up. But some of this is going to get offset by the input tax credits that the business will be eligible for. The estimation of the impact does not seem to be very significant as a result of transition to the GST. So there is no question of Anti-Profiteering currently being applicable. Benefits will be passed considering the overall picture. The company doesn't believe that applying variable pricing in different states just because taxes in one state have gone up and those in other states have gone down is practical . As the e-Tax exempt screens and other partially and fully exempted screens will come under the purview of GST , there is an uncertainty that how the respective state governments will be honoured under the revised GST regime and what each state would do in form of refund mechanism to grandfather / kind of give rebate to some of these scenarios. More clarity will emerge in the next 3 months, but all that has been factored in and it won’t effect the operating dynamics of the business. There is a very little upside still to be gained simply because DT Cinemas are at the very last stages of getting renovated and rebranded as PVR. The bulk of it has already come in but there would be a little upside about 10-15% more that they will be able to extract out of the DT property as festive season comes. • Employee costs have shot up as there are some one-off annual incentives. Two states which were bound for local elections, Delhi and Karnataka increase minimum wages in end of March by 35% each. The normal increase typically in a year is about 8-10%. Some part of this no. is one-off incentives which will not be there in Q2. Around 13% to 14% will be a continuing kind of number corner leasing basis and increments that is generally given and 7% would be a one-time kind of number which will be there in the coming quarters. 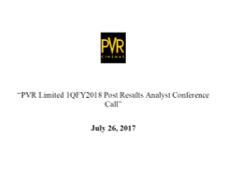 PVR intends to sustain pricing at existing levels and they do not expect any pricing changes in the near-term. The impact is also looking higher especially in Q1FY18 last year, because of demonetisatio PVR did not take any price hikes and the price hikes were all deferred. So the price hikes are all now reflecting cumulatively in 1Q. Volume increase more in gold and silver cinemas rather than the platinum cinemas. In case of single screens, they will go to consolidators, so they may not be able to get any attraction on advertising if they were to go out and their own cinema separately. In case of new screens the same growth in ads revenue cannot be seen as it takes time for advertisers to start coming in full throttle. There are a lot of big properties that have come up for renewal either later part of last year or early this year. So, as a combination of those properties when you do a comparison of comparable properties, Q1FY18 looks higher compared to last year. The growth happens in a bunch which is about 15% every block of three years. In some properties, PVR has a concept of revenue sharing as well. So, especially in some of the properties where Bahubali has done really well in southern part of India, there is some component of revenue share also attributable in this 9% kind of same-store growth. CAPEX is a combination of screens which actually end up opening and which are under planning of the fit outs have commenced. Some of the capex will also involve renovation and upgradation that PVR is doing for its existing portfolio of screens. PVR’s average broad CAPEX is largely in the same range where the only increase in CAPEX per screen is really in the case of technology upgradations. The technology is far more expensive, but clearly the payback is compensated by the higher pricing power and higher sponsorship for those formats. The CAPEX will largely be similar to last year which is in the range of about Rs275- 300 crore that is broadly the outlook for CAPEX as of now. In the last quarter 30% more movies were released as compared to last year but there was a 7% decline in the admissions, even when Baahubali was there. This effect can be explained in a way that this is a cyclical business thud it is better to compare the whole year business than to compare quarterly business there are many factors which gets balanced through the year. Some actor-led production houses have distributed their films directly. But this is not a new practice and the performance of the movie depends on the content. Both Netflix, Amazon Prime, and of course Jio, have been investing heavily with also a lot of smaller platform having investing heavily in this market. But this is all good because this will bring money to the whole supply chain and theatre will remain the legal source to watch the movie in its first few weeks. Also, a lot of spending t case of housekeeping, some one-off expenditure came in this quarter due to some upgradation. But the impact of that would be about 2% - 3% on that account.